Aveiro, Coimbra, Serra da Estrela, Leiria, Fatima and the beautiful Portuguese West Coast are some of the treasures of central Portugal, a region diverse in landscapes, culture, gastronomy and climate! From the snow capped peaks in the Serra da Estrela mountains to the Figueira da Foz beach. From the University of Coimbra to the Aveiro estuary, and not forgetting the beautiful shale villages that spread through the mountains and the beautiful city of Tomar, there is plenty to see and live! Whether it is for a permanent residence, as a holiday home or to transform into a business opportunity / real estate investment, there is no shortage of opportunities at attractive prices and top construction. The demand for real estate in this region has increased a lot among other reasons because of the beauty and richness of the region allied to the good offer of infrastructures and services. 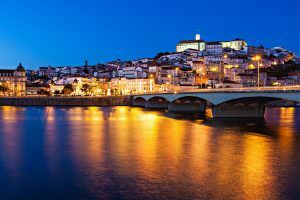 That’s the proposition of the Ansião’s tourism, located in the district of Leiria, to attract visitors more and more. Known by being a rural council of historical tradition, whose origins remount at the prehistoric times, Ansião counts with a vast cultural history. It presumes that there are about 190 million years ago the lands of that council were submerged. The Ansião municipal district has the “freguesias” of Alvorge, Ansião, Avelar, Chão de Couce, Lagarteira, Pousaflores, Santiago da Guarda e Torre de Vale de Todos. The first references of Ansião history dates from 1175. However, only in 1514, D. Manuel elevated the place to village. For the most believing visitors, the council of Ansião counts with an extensive religious patrimony, such as the Mother church of Ansião, the Chapel of Constantina, the Mother church of Alvorge, the Chapel of the Mercy, the Chapel of Ateanha, the Church of “Nossa Senhora da Graça”, the Mother church of Santiago of the Guard, S. Domingos’s Church, the Mother church of “Nossa Senhora da Guia”, the Mother church of “Chão de Couce”, the Chapel of “Nossa Senhora do Pranto” and the Church of “Nossa Senhora das Neves”. Other marks are also important to know a little bit of the past of Ansião and of their people, as the majestic “Residência Senhorial dos Condes de Castelo Melhor”, the Ruins of the Tower of “Ladeia”, the bridge of “Marquinho”, the bridge of “Cal”, Medieval Oven of Avelar and farm of “Cima”. The windmills complete the scenery of the council, that keeps in itself an extensive green area, in an authentic valorization of the nature. But the historical patrimony continuous being the great attractive of the council. The Municipal Museum cannot be forgotten in this trip through history, that remounts for many centuries. It is proved by the existence of an “Anta de Atalaia”, other in “Alto do Pisca” and the location of a “castro” by the age of the iron in S. Miguel. The trip should continue for “Alvorge” and “Torre de Vale Todos” e “Lagarteira”, populations that were located in the area of the “Ladeia”, known as border line among Christians and Moorish in the centuries XII and XIII. Imagine a land where the arab influence is part of their traditions and where the nature and the religion dictate the rules. 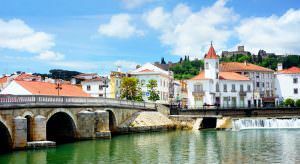 That’s Alvaiázere, a portuguese town that belongs to the district of Leiria, with about 1.800 inhabitants. The municipal district of Alvaiázere counts with seven “freguesias”: Almoster, Alvaiázere, Maçãs de Caminho, Maçãs de Dona Maria, Pelmá, Pussos e Rego da Murta. The council owes its name from the arabic influence in the area. When those people invaded the Iberian Peninsula, in the year of 711, they took possession of great part of the actual portuguese territory, that’s the case of Alvaiázere, which was called Al-Bai-Zir or Alva-Varze, according to the history. In spite of the years, the municipal district always maintained their cultural characteristics. One of the most important points of the council is the mountain of Alvaiázere, from where it is possible to see an excellent panorama of that place, in a relaxing atmosphere. 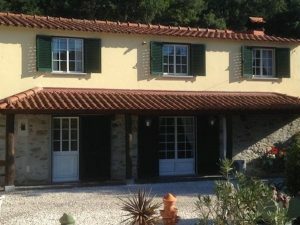 The landscape is also composed by vineyards, olive trees, corn fields and beautiful houses. The hillsides keep the purity of the flocks and of the goats, in a municipal district where the nature is intense, with the presence of valleys and holms between two courses of water, Nabão and the riverside of Alge. There are prehistoric artefacts and dispersed archeological places a little bit for the whole council. Antas do Ramalhal, a Rominha and the town of the Mountain of Alvaiázere are one of the main tourist points of that area, that keeps an important historical marks. The agriculture is the economic base of this area. The fertile soils, the valleys, the holms and the hillsides covered with vineyards and olive trees, were important auxiliaries of the population. But the history was made through the times. Alvaiázere was elevated to village by D. João I, in 1338. In 1435, D. Duarte donated the village to his wife, the Queen D. Leonor, passing Alvaiázere to the domain of the crown. D. Manuel gave its new designation, on May 15, 1514. In this year, not only the town of Alvaiázere received new designation. The actuals “freguesias” of the council, also Maçãs de D. Maria e Pussos (known as Vila Nova de Pussos) they also obtained the privileges of that document. The signs of the past and of its history are still evident in the whole council of Alvaiázere. In that place, there are several solar and elegant farms, all with centuries of history. In the headquarters of the council exist a solar that belonged to Duarte Pacheco Pereira, the famous murderer of D. Inês de Castro, before fleeing for Spain, in one of the most known episodes of the portuguese history. 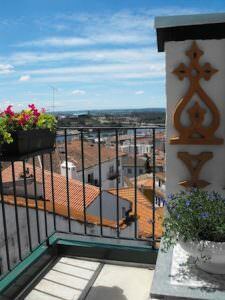 In the “freguesias” of Alvaiázere is possible to meet the antiquity through the pillories and of their churches. The religious spirit of this people is expressed in the legends that circulate from father to son, for many centuries. Now a day, Alvaiázere is known by being the capital of the “chícharo”, a small vegetable, that has the same treatment of the bean, but it grows in arid lands. Alvaiázere is the perfect place to try this vegetable that is made by varied ways. Besides the “chícharo”, the cheese of the area is also know as a good product and also the pig meat, the kid goat and the suckling pig in the oven. All of this may be accompanied with the excellent wine of the region. “Bride’s cake” is the favourite candy of the people and of their visitors. A true trip in the time, where is possible to know more about the rich history of the council, passing through the best of its gastronomy, without forgetting the nature in all the places of Alvaiázere. Castanheira da Pera is a small portuguese village located in the district of Leiria, with about 3.600 inhabitants. The council of Castanheira da Pera is constituted just by two “freguesias”. Castanheira da Pera and Coentral. At this second “freguesia”, Coentral, is located one of the tourist marks of the council: the Chapel of “Santo António da Neve”. In the antique “Cabeço do Pereiro”, in Lousã’s saw, the Chapel of “Santo António da Neve” was built by order of Julião Pereira de Castro. During the years, the chapel was in the hands of the particular proprietors, but in 1954 it was acquired by the commons council of the Castanheira da Pera. After that, Coentral had the ownership of the chapel, which is classified as Property of Public Interest since 1986. But the council also keeps other attractions, as the Fluvial Beach of the “Rocas”, with almost a kilometre of extension. The beach is composed by a swimming pool with artificial waves, considered the largest one in Portugal. After the opening of this tourist complex, in 2005, more than two hundred thousand people visited Castanheira da Pera. Other places, such as the “Poço Corga’s” Fluvial Beach, the Riverside of “Pera”, the Riverside of “Quelhas”, the saw of “Lousã”, the Old Chapel of “Pera”, the Museums “Casa do Tempo”, “Lagar do Corga”, “Casa do Neveiro” and the “Casa do Soares” are still very solicited by the visitors. For several years, the bet of the council’s economy was based in the wool. The first factory was created in 1860. However, in 1980, the industry began to cross a serious crisis. In this time, a lot of factories were closed. Nowadays, the new bet of the council is the tourism. Besides the local patrimony, the council offers several advantages for those who prefer to admire the landscape. For who visit the “Castanheira da Pera”, there are proposals of pedestrian courses in a fantastic environment. Never forgetting the parties and pilgrimages ´during the year. The gastronomy of this region is prized for its diversity: From the fish and shellfish of the coastal zone to the more elaborate and substantial dishes of the interior going by the roasted kid, the escabeche’s trouts, the “serrabulho”, the cheese and the cheese spread, the kid giblets rice, the anise cakes and the famous honey, typical of the Lousã’s saw. In the part of wines the region includes a series of wine regions, among them the famous Bairrada and Dão. The sand of São Pedro de Moel, Figueira; the river of Aveiro and the river beaches of the interior or the imposing bay of Castelo de Bode, at the gates of Tomar, an immense mirror of water bordered by charming villages. 2 km away from Góis in the center of Portugal! Luxury mansion for sale in the heart of Portugal and in easy reach to Lisbon. 24 hours security! The ideal estate in Central Portugal for lovers of the nature and the the flair of the real Portugal. 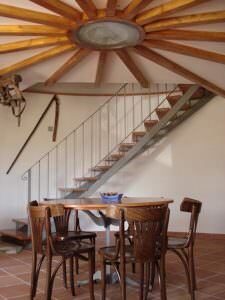 Amazing commercial property for tourist accommodation in the heart of Coimbra in Central Portugal. 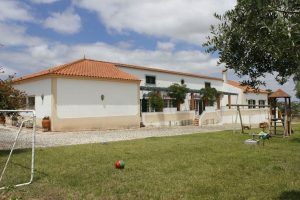 A Central Portugal farm with the traditional style and characteristics of the area.